The Downtown Phoenix Vocabulary explores exactly what a “game-changing moment” in our community is and what may be on the horizon. 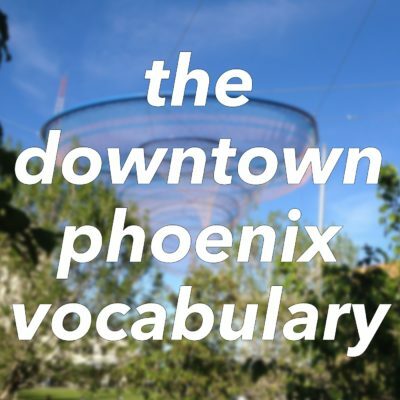 [From time to time and inspired by the goings-on in and around downtown Phoenix, I am going to produce some updates to “The Downtown Phoenix Vocabulary,” which will be filled with words, phrases, and ideologies that either should be continued in our part of the world or, more likely, discontinued. You can read all of the posts as they are added at edwardjensen.net/tags/downtown-phoenix-vocabulary. The last big essay I wrote, “Another Day, Another Strikeout,” garnered both praise and criticism as I expected. Its fundamental question — is there an economic development strategy for downtown and midtown Phoenix? — still remains unanswered. Some readers were quick to remind me that some small companies are moving or expanding downtown, with WebPT’s recent expansion in the warehouse district cited by one particular reader as a “game-changing moment” for downtown. While I think this was brought up to deflect attention from the question at hand, it did make me think that we need to have a discussion on what a “game-changing moment” is, especially when it comes to urban Phoenix. Some future game-changing moments in potentia include the redevelopment of Hance Park as a world-class urban space that adds to the urban public infrastructure, the building of the Portland on the Park project adjacent to the Japanese Friendship Garden and Hance Park that is downtown’s first condominium project since the Great Reset, and when downtown’s University District — home to all three Arizona state universities — is complete in a few years’ time. Ground was just broken on the new Arizona Center for Law and Society on Arizona State University’s campus, which unlike many downtown advocates, I actually support its building and siting where it is.